This is the oldest postcard I've written about so far! It is dated July 14, 1906. 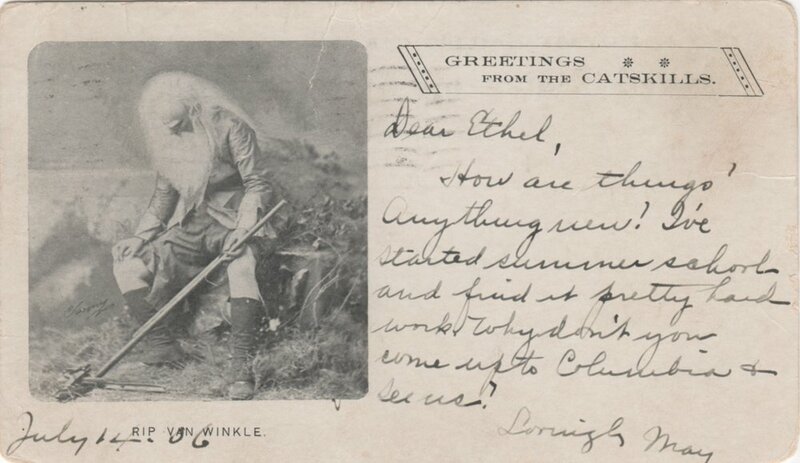 The printed card is titled "Greetings from the CATSKILLS" and has an image of of a groggy Rip Van Winkle on the left side. Can you imagine sleeping through the American Revolution? How are things? Anything new? I've started summer school and find it pretty hard work. Why don't come up to Columbia and see us? It is addressed to a Miss Ethel Rosemon at 413 Quincy St. in Brooklyn, NY. I am certain that this is the Ethel M. Rosemon who was listed on the 1905 New York, State Census. At that time she was listed as 19 years old and living with her parents, Vincent and Marnie Rosemon. She appears to be an only child. Here is what 413 Quincy St. looks like present day via a google maps screenshot. With just a few minutes of newspaper clipping research I was able to find out a lot about Ethel. Here is just a sampling. And apparently Ethel began to make a name for herself, first as an amateur actor and then a professional. As this article says: "Prominent in the cast is Ethel Rosemon, whom Brooklynites will remember both as an amateur, before she entered upon her professional career, and afterward in important roles under some of the best managements." Ethel even worked in some of the earliest days of film in the "photoplay" world. Later she had her own acting troupe: "The Rosemon Players". My sense is that that there is MUCH more available to learn about Ethel Rosemon's life with some more internet sleuthing. I stopped my research here for lack of time, not lack of content. I would love if one of you found Ethel's life interesting and wanted to learn more. If you do find anything please share it! Who was "May" who wrote the postcard? When and how did she die? How long was her acting career? Are there any archival films available of her? Did she have children or grandchildren who might be interested in seeing this postcard? (if you find them, please let me know and I would be happy to send them this card). How did Ethel's life in the arts impact her sense of legacy, if she had one?